To maintain your EMS certification in Virginia, EMS providers must complete and submit the state requirements for recertification PRIOR TO THEIR CERTIFICATION EXPIRATION. Recertification requires that the Office of EMS receives all continuing education (CE) requirements prior to the providers EMS certification expiration to prevent the provider from being placed in re-entry status. 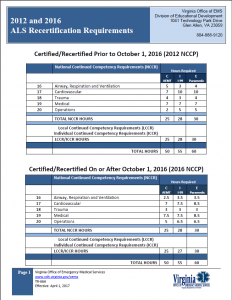 In order to recertify your EMS credential in Virginia, you must meet the continuing education (CE) requirements for your certification level prior to your certification expiration date. You can check your CE report online, in your Virginia EMS Portal, 24/7/365. Virginia does not require providers to maintain their National Registry certification. 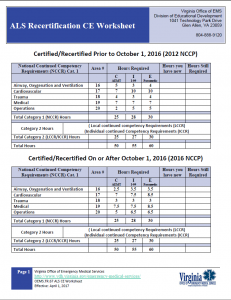 Should you desire to maintain your National Registry certification; visit www.nremt.org for more information on their recertification process. Need help finding a CE course? Have you completed all your CE Requirements? At the beginning of month of your expiration, the system will automatically recertify you and we will mail your new certification card out by the 5th of each month. If you have any questions about recertification, please contact Debbie Akers. Providers who gained Virginia certification through Legal Recognition must complete the written and practical examination; in addition to completing the CE hours required. 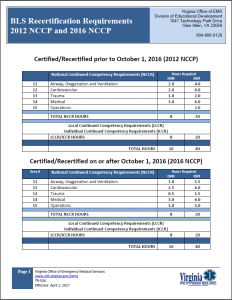 The specific CE hours and content areas for recertification are listed below by level. If you gained your certification by Legal Recognition, additional recertification requirements are required and can be found below. Click the link below which correlates to your certification level or method of entry into Virginia’s EMS system. BLS providers who obtain their EMS certification through legal recognition must complete the required Virginia EMS continuing education criteria prior to their certification expiration date AND pass both the National Registry Cognitive (written) exam and Virginia psychomotor (practical) examination. Providers whose Virginia certification has lapsed are considered to be in re-entry status. Re-entry is a two-year period in which a Virginia provider is not certified and may not practice at the lapsed level of certification, but may complete all remaining CE requirements and test to regain their certification. Virginia providers in reentry may not use National Registry Reciprocity to regain a lapsed certification.